Heritage Auctions has shared the following press release regarding its recent World and Ancient Coins sale at the Chicago International Coin Fair in Rosemont, Illinois. DALLAS — Famous rarities from Australia and Canada led the results in Heritage’s April 14-19, 2016 CICF World Coins & Ancient Coins Signature Auction in Chicago, hammering prices totaling more than $6.3 million in all. “Demand continues to be solid for the best examples across the market,” said Cristiano Bierrenbach, Vice President of Heritage Auctions. “We’re continuing to see great examples of a wide variety of international coins coming out of top shelf collections. Our clients are responding to that enthusiastically. 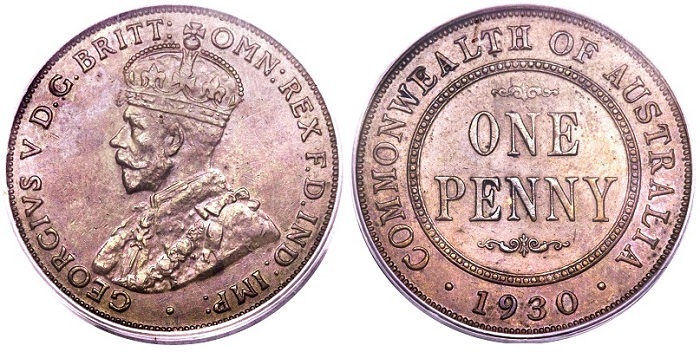 Australia contributed the legendary key date rarity 1930(m) penny. Certified as AU50 by PCGS, this is by far the finest example of this issue seen at Heritage and it’s tied with one other piece for the finest certified by PCGS, with none certified at this level by NGC. Its final price realized of $70,500 is an American record for this coin and believed to be a record result in any auction. From Canada comes the 1870 No LCW 50 cents, at MS64+ the finest of this coveted issue to ever have been certified by PCGS. Neither the Pittman, Norweb nor Belzberg collections contained an example of this issue certified in Mint State, and PCGS has certified only three Mint State examples. 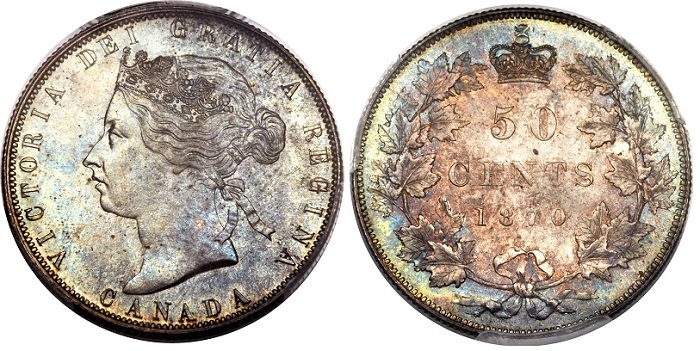 This incredible near-Gem exemplar of the first Canadian 50 cent issue sold for $70,500. A classic issue of Dutch Colonial Brazil, the 1646 Pernambuco GWC gold 6 Guilders brought an impressive result when it sold for $64,625 against a pre-auction estimate of $30,000+. This extremely rare piece, featuring a crude diagonal strike, is a nice MS62 NGC example of this elusive series, of which perhaps 50-60 pieces of all dates and denominations survive, a number of which are in museum collections. The Ancient coin offerings featured plenty of strong results, best exemplified by the Syracuse decadrachm of Dionysius I (405-367 BC), signed by Euainetos. This beautiful example of this classic issue was certified AU by NGC, Fine Style, and sold for $47,000 when the hammer fell. The numerous named collections in the sale, all sold completely without reserve, all attracted considerable enthusiasm that translated to strong bidder participation and prices. Those include: The Collinson Collection (Australia), The Richard Woit Collection (Russia/Iran), The FoxLair Collection (Mexico), The Eric P. Newman Collection (Ancients), and The Pura Vida Collection (Costa Rica). Swedish Possessions — Riga. Christina gold 4 Ducat 1646 H-W AU53 NGC: Realized $64,625. Poland: Livonian Order. Gotthard Kettler gold Double Gulden (2-3/8 Ducat) ND (1559-61) XF45 NGC: Realized $64,625. Poland: Casimir the Great (1333-70) Groschen ND MS60 NGC: Realized $28,200. Switzerland: Confederation gold 100 Francs 1925-B MS66 NGC, Bern mint, KM39: Realized $27,025. Roman Empire: Tiberius (AD 14-37). AV aureus, Lugdunum, ca. AD 18-35. NGC MS(star graphic) 5/5 – 5/5: Realized $25,850.